When author Usha Rajagopalan looked out of her balcony at L&T South City, JP Nagar one day in January 2008, she saw a vanishing lake called Puttenahalli Kere. Usha immediately decided to save the lake. She refused to let it die a quick death, like hundreds of other lakes in and around the city. Together with a few others, Usha formed a team titled ‘Save Our Lake’. The team then brought the lake’s poor condition to the notice of the BBMP. Revival began in January 2010. 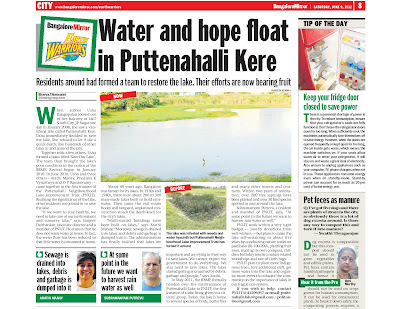 In June 2010, Usha and three others - Arathi Manay, Prasanna K Vynatheya and O P Ramaswamy — came together as the first trustees of the Puttenahalli Neighbourhood Lake Improvement Trust (PNLIT). Realising the significance of the lake, other residents too joined in to save the lake. “If we want to stay healthy, we need to take care of our environment and conserve lake,” says Sanjeev Daithankar, associate director and a member of PNLIT. He ensures that he does not waste water at home. In fact, the water flow has been reduced so that little water is consumed at home. About 40 years ago, Bangalore was famed for its lakes. In 1930s and 1940s, there were about 200 to 300 man-made lakes built to hold rainwater. Then came the real estate boom and rampant, unplanned construction struck the death-knell for the city’s lakes. important and are trying in their way to save lakes. We cannot expect the government to do everything. We also need to save lakes. The lakes started getting encroached by debris, garbage and people,” says Arathi. In May 2011, the BBMP formally handed over the maintenance of Puttenahalli Lake to PNLIT, the first instance of a lake being given to a citizens’ group. Today, the lake is home to several species of birds, butterflies and many other insects and creatures. Within two years of restoration, over 200 tree saplings have been planted and over 50 bird species spotted in and around the lake. PNLIT work within a very tight budget — mostly donations from well-wishers — but plans to make the lake self-sustaining in about five years by conducting nature walks on paid basis (Rs 100-200), planting fruit trees, making its own compost, children birthday tourism nature related workshops and sale of cloth bags. PNLIT plan to plant more indigenous trees, hire additional staff, get more water into the lake and organise more events to educate the community on the importance of lakes in our fragile eco-system.